Readers wonder if this means they’ll suddenly be confronted with unusable files in their iOS 10 and macOS Sierra and older systems, or when they try to interchange files with people outside the Apple ecosystem. However, Apple’s whole approach to these new formats isn’t a sharp break from the past, something the company has been known to do before. Rather, based on its developer documents and video presentations from WWDC, it’s clear they have designed everything around the notion of graceful degradation. That concept means that when the optimum approach fails, a system tries less and less optimum approaches until it reaches compatibility. Apple explains to developers how its new media framework delivers the right format. The new OSes will store everything they capture in the new formats by default, and allow developers to wire in the same frameworks to allow third-party apps to do the same. As long as you’re within the OS or app, those are the formats that are used. 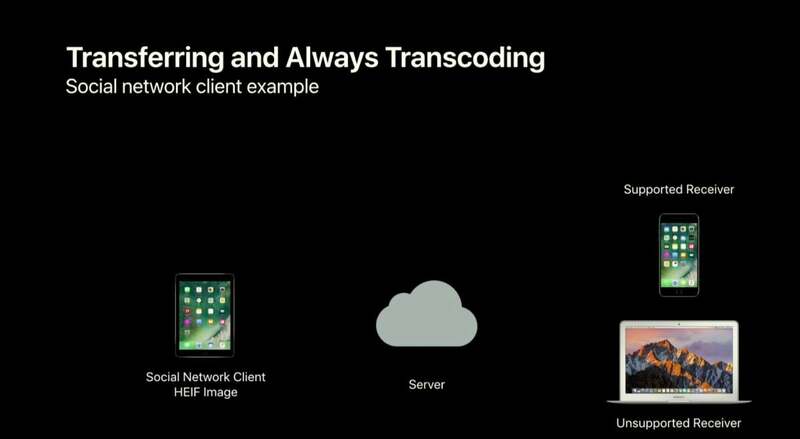 However, when you leave those confines—say, by sharing an image to another app or emailing a video to someone—iOS and macOS’s media software will determine whether or not the receiving part of that equation can reliably play the more compact format. If not, it will deliver up a compatible option. I know, I know: you’re sure that this can’t be reliable. However, based on the details provided, Apple will err on the side of compatibility. Given that Apple’s HEIF is based on a standard that allows for a lot of variation, it’s unlikely we’ll see other systems read it for some time. HEVC, otherwise known as H.265, is already widely supported in some devices and its compatibility will only grow because of the huge savings in streaming bandwidth used. It’s still not clear to me how Apple will manage HEIF and HEVC in iCloud Photo Library. I have the public beta of iOS 11 installed on an iPad, and the photos taken with it sync properly to iCloud, but on my other devices, the show up as JPEG files, not containers. It’s possible that the central iCloud sync will retain HEIF files and sync JPEG to the end points, but then what happens when you edit a file on a Mac running an older version? That’s what we’ll have to wait to find out.